Keep reading if you want to know more about the details. Unmanaged device: This can be considered as the ‘Bring Your Own Device type’ of scenario, but not managed by Intune. Managed device: In this scenario the device is managed by Intune and onboarded into Azure AD using an Azure AD Domain Join. The Azure AD Domain Join is required to let user login onto their devices using their corporate ID and establish SSO with Cloud applications without the need of on-premises federation services. The Azure AD Domain Join can be either achieved using the Hybrid Azure AD Domain Join setup or by enabling the standalone Azure AD Domain Join. The scenario in this blog describes the standalone option. So how does the scenario look like? Azure Active Directory is used for Intune and Office 365 purpose. In my demo scenario the account are provisioned using Azure AD connect. Password sync is disabled. A federation is being setup between Okta and Azure AD based on the WS-Federation protocol. In this setup Okta is identified as the Identity Provider and Azure AD as the Service Provider. Okta is used as the corporate authentication source (IdP). In this scenario the accounts and passwords are provisioned using the Okta Azure AD agent. A federation is configured between Okta and Salesforce based on the SAML protocol. The Azure AD application portal is used to present applications to the end user. A federation is being setup between Azure AD and Okta based on the SAML protocol. In this setup Azure AD is identified as the Identity Provider and Okta as the Service Provider. The federation described in (diagram) step 6 is required to enable a Single Sign On experience for Azure AD Domain Joined devices. During the login on the device an Azure AD token is retrieved which can be used to enable a Single Sign On experience to Azure AD federated applications. In this scenario, Okta is the Identity Provider which requires an Okta token to enable the same experience. To achieve this, a federation is configured as described to leverage the Azure AD token during the device login to retrieve an Okta token. A. The user logs in to the device. B. An Azure AD token is retrieved during the initial sign in. C. The Azure AD token is used to access and enable a Single Sign On experience to the Microsoft MyApps portal. D. The Salesforce application is selected in the application portal which points to the Salesforce configuration settings in Okta. This initiates a redirect + SAML post request to Azure AD. E. The SAML post requests to Azure AD which consumes the already existing Azure AD token. This initiates a redirect + SAML Post request back to the Okta SAML endpoint. F. The SAML token is consumed by the Okta endpoints and issues an Okta SAML token. G. The Okta token is used to access the Salesforce application. The trace below you’ll find the exact Post and Get messages related to step D-G. Please note that I have enabled MFA in Salesforce which is also visible in the trace below. So how do we set things up? 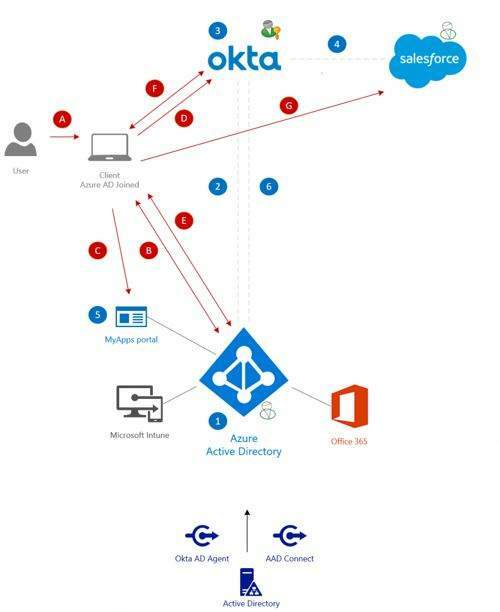 Setup of the integration between Azure and Okta. Hybrid identity connection between AD and Azure / Okta using Azure AD Connect and the Okta AD agent. Federation between Okta and Salesforce. 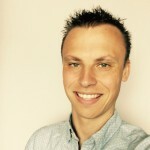 Jurgen van den Broek has been working for 4 years at Sogeti and currently entitles the consultant/architect role. His main area of expertise is Identity and Access Management and Cloud. In the last couple of years, he has been involved in several engagements with different customers. More on Jurgen van den Broek. How can we see the setup for this scenario?